An article in July 2015 from the Daily Mirror revealed that the new Newcastle manager, Steve McClaren had banned his players from swearing. According to the Mirror, "The F-word and worse are now off-limits, even at times of frustration, for players and staff. The measure is one of a strict raft of new rules, including a mobile phone ban while at work, to tighten discipline and concentration." The BBC reported that McClaren's assistant, Paul Simpson said (when they were both at Derby County) that, "If you're ranting and raving and swearing, you haven't got control," Simpson said in February. We say you are losing it so you may as well come and sit in the dugout... We try not to swear if we possibly can, and we certainly don't use foul and abusive language in the technical area when we are talking to officials." 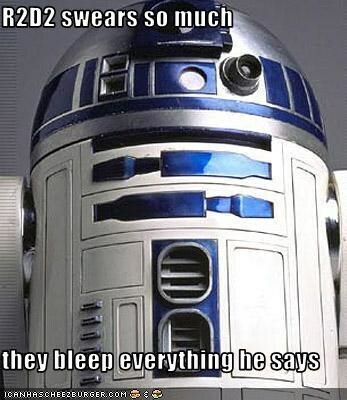 Just in case you didn't know, R2D2 is a droid from the Star Wars movie series! He always makes little bleep noises. So, how many times do you think you swear in the average week?! According to a report published by the Association of Psychological Science called, 'Perspectives on Psychological Science' (Timothy Jay, 2009), the percentage of people's words that are swear words is between 0.3% and 0.7% of the total words they use (common words like "I" and "we" and "he" and "she" are around 1% of the words we use). There are lots of reasons why people swear. They are often used negatively to express opinions about others. Or they are used to release frustration. Or they are used in a positive way e.g. in telling jokes. Swearing is also used when people can't find the right words to express themselves and say what they mean. As a Christian, one of the funny things s that people use all kinds of words as swear words - including "Jesus" and "God". It's interesting that people never say, "Allah" or "Buddha" as swear words! According to a Fox Business report, 81% of employers believe that swearing makes a worker much less professional. 64% of employers think less of employees who swear and 57% of employers would be less likely to promote someone who swears. So if you swear you are much less likely to be respected or promoted. Finally, 54% of employers believe that swearing makes a worker appear much less intelligent than someone who doesn't swear. The report also shows that some employees have been fired because of swearing, although usually the swearing is part of a bigger problem. So what's the point we're making? What we say often tells people about us and what's on the inside of us. The good thing is that when we speak, we can choose to use positive words and say good things to and about other people. This can make a massive difference to how others feel and as we say good things, it will also make us feel better as we see other people more happy. The Bible says, "Pleasant words are like a honeycomb, Sweetness to the soul and health to the bones." (Proverbs 16.24). The Bible also says, "you have been trapped by what you said, ensnared by the words of your mouth.." (Proverbs 6.2). The Bible also tells us that our words can bring life and death - maybe not literally (although some people have killed themselves because of the nasty things other people say about them). So why not speak kind words to people? Say positive things to encourage people. Don't waste your time saying nasty things and why bother swearing if it could get you into trouble and harm your future or other people? The lesson is that Jesus went around speaking good words and helping people. It's OK to get angry, especially when you see injustice. But the people who really get on in life - the very best bosses - are those who encourage people and say kind things. Not those who swear!